David Marion Rush of Louisburg, Missouri, applied for a patent for ten-key non-printing manually operated adding machine on July 25, 1883, and the patent (U.S. Patent 292256) was granted on January 22, 1884. 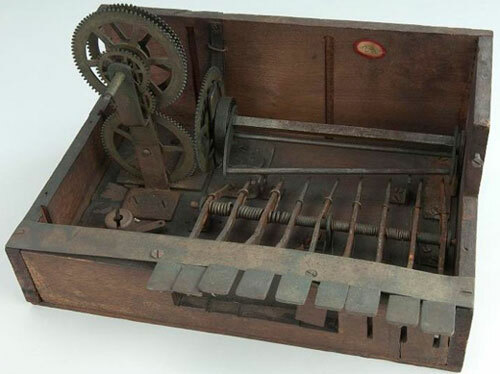 A part of the patent model survived to our time and it is kept now in the collection of National Museum of American History, Washington (see the lower photo), although it is in very poor condition, lacking the mechanism for recording totals, as well as the upper cover. It is a metal and wood made device, with overall measurements: 16.5 cm x 27 cm x 20 cm. The keys for entering numbers (marked with C) are connected to the main operating-shaft E, which has the spring F and the wheels G and H secured to one end. 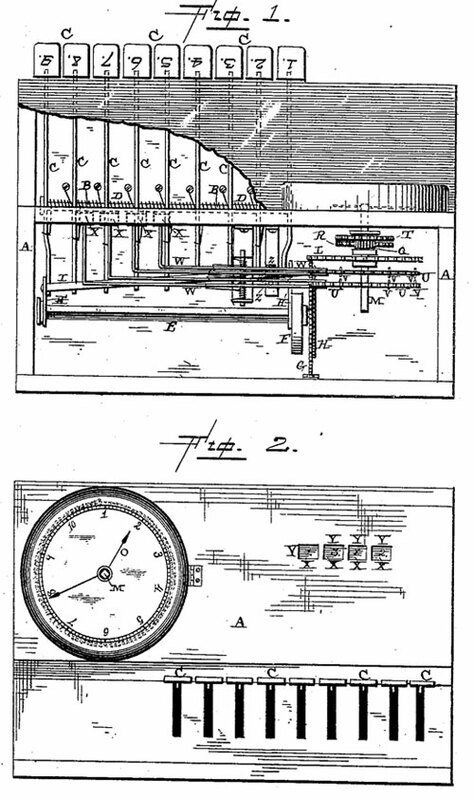 The spring returns the shaft and the wheel H back to position after it has been moved by one of the keys, while the wheel G operates the counting mechanism. The ratchet-wheel H on the end of the shaft E contains one hundred cogs, so as to correspond to the number of teeth on the wheel G.
The wheel G upon the end of the main shaft contains one hundred cogs, and meshes with the wheel J, which is placed at right angles thereto, and which may contain any suit able number of cogs. This wheel J meshes with the wheel L, which has one hundred cogs, and which is secured directly to the shaft M, upon which the larger indicator-hand is secured. This indicator-hand sweeps around over the face or dial, which is divided on its outer surface into ten points or divisions, and which is subdivided again into ten spaces. The smaller indicator-hand 0 indicates the number of hundreds the larger hand has swept around the dial. 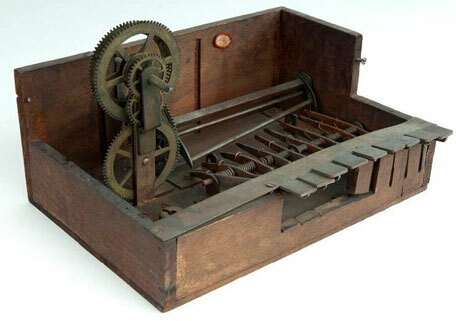 The motion of the calculating mechanism is transferred not only to the clock-like dial in the left part of the machine, but also to numbered blocks, moved in curved grooves, for the purpose of showing the figures through the slots Y, which are made through the front of the frame. One of these slot will indicate units, another tens, another hundreds, another thousands, and so to any desired degree (on the patent drawing are shown only 4 slots). Who was the inventor David Marion Rush? David Marion Rush was born on 27 Nov. 1849, in Barren County, Kentucky, first child in the family of Daniel W. Bush (9 Oct. 1824–18 Jul. 1901) and his first wife Rhoda J. Chapman (2 Nov. 1828–11 Jul. 1861). In 1852 he moved with his family to Polk County, Missouri. He studied in the public schools and then, for three years beginning in 1871, at a private school in Urbana, Missouri. After teaching from 1874 to 1884, David Marion Rush entered the patent rights business. He received two patents of his own, one for a washing machine (US250395) and the other for the above-mentioned adding machine. From 1886 until 1890s, he was county collector in Wright County, Missouri. Later David Marion Rush was a judge in Buffalo, Missouri. David Marion Rush married on 2 June, 1878, to Vivia Twin Lindsey (21 Nov. 1859–28 Mar. 1932). The family had 6 children: Dolores (1879–1954), Lascelles (b. 1881), Loise Howard (b. 1883), Norma Logan (b. 1885), Erle Melvin (1890–1961) and Cyril Nadine (b. 1896). David Marion Rush died on 21 August, 1940, in Dallas County, Missouri.